DENMARK: Siemens' new roll-on/roll-off vessel -- and there is another to come -- promises to cut the cost and ease the complexity of transporting large offshore wind-turbine components. Eize de Vries reports from aboard the Rotra Vente. The first of two specialised roll-on/roll-off (ro-ro) vessels commissioned by Siemens for transporting nacelles, tower sections and rotor blades was launched in the Danish port of Esbjerg last December. "We are stepping into a new era of cost-efficient offshore wind logistics," said the company's offshore CEO, Michael Hannibal. "Once our blade factory in Hull and nacelle factory in Cuxhaven have become fully operational, these ro-ro vessels will interconnect our manufacturing hubs with wind-farm construction supply ports. The ro-ro concept is further boosted by the fact that in Cuxhaven, we will be able to load towers from German suppliers, too," Hannibal said. 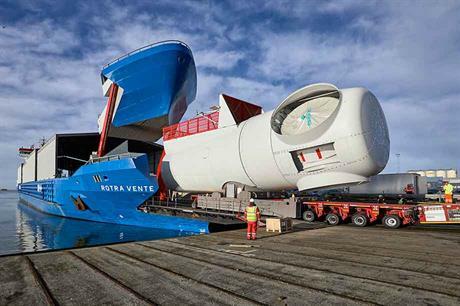 The Rotra Vente incorporates a number of innovations, leading with the ingenious hydraulically raising-bow section that creates an opening large enough to wheel-in complete nacelles for Siemens' 7MW turbine on self-propelled modular transporters (SPMT). The restructured cargo deck incorporates a huge fabricated steel ramp that can be brought out for creating a stable loading pathway to a quay for smooth SPMT passage. The ramp is pulled-in again as part of the sailing mode, together with the lowered and completely sealed-off bow section. In addition, the 141-metre vessel is equipped with a ballast tank system that can rapidly pump water from back to front and vice versa to keep it stable during loading and offloading. Another distinct feature is the (removable) telescopic roof. Closed, it protects turbine nacelles from salty seawater spray during transportation. Open, it allows loading by crane at harbours that lack ro-ro ramp infrastructure. Crane-lifting operations are considered a safety hazard, so minimising crane deployment within the ro-ro system makes for safer overall working conditions. Making maximum use of the flexibility of the available deck space, the Rotra Vente can handle full transports of up to eight nacelles, or nine tower sections (sufficient for three turbines), or up to four rotor blade sets. The roof is not an absolute necessity for tower and blade transport, said Siemens' head of shipping, Thomas Mortensen. "The first ideas for a ro-ro vessel date back to 2012-13, when we realised that within years some hundreds of turbines, towers and blades would have to be transported," said Mortensen. "A second observation was that the individual components were getting increasingly bigger and heavier. The rotor blades for the D7, for instance, are about 50% longer and heavier than the blades fitted to the SWT-3.6-107," he added. Siemens issued a tender in early 2015, opting to save time by using two existing container ship hulls as a design base. The vessel was rebuilt for its new purpose at Holland Shipyard in Hardinxveld-Giessendam in the Netherlands. "Due to the innovative design, additional challenges and demands, our experts and external partners spent a total of 90,000 design hours and 120,000 man hours to complete the Rotra Vente," said Mortensen. The envisaged vessel had to meet likely future demands, including a built-in capability to accommodate next-generation wind turbines and corresponding components, he added. The Rotra Vente started operations on 3 November and, according to Mortensen, loading and offloading times have been cut substantially and are still being reduced. "Our current record for unloading eight nacelles stands at five-and-a-quarter hours, but equally important is building-in sufficient flexibility for coping with many ongoing project installations, changing project schedules and, at the same time, minimising necessary stock levels in main supply ports. In other words, all the numbers have to add up," he said. The cargo loaded during Windpower Monthly's visit comprised a mix of tower sections and nacelles. For the towers, a functionally comparable multi-wheel vehicle solution offering maximum manoeuvrability was developed. Each component is brought in individually, put in place and safely stowed to the ship deck. The nacelle hubs are slowly rotated during sea transport to protect the rotor bearings by compensating for negative vessel-wave impact and ship-engine vibrations. A sister ship, mainly to transport towers and blades, is under construction, expected to be delivered in spring. This vessel will ship rotor blades from Siemens' production facilities in Hull, UK or Aalborg, Denmark, to project supply ports in the North and Baltic seas. "Between now and September we will install over 200 D6 and D7 turbines," said Mortensen. "When both vessels are in full operation, they will cover 70-80% of our in-house sea transport demand, with substantially more flexibility. "For new wind projects we expect 15-20% overall cost savings compared with current sea-transport procedures. It will become another important contributor to further driving down the offshore levelised cost of energy."